One of the main challenges facing the chemical industry is the transition to sustainable operations. Industries are taking initiatives to reduce resource intensities or footprints, and by adopting safer materials and processes. Such efforts need to be supported by techniques that can quantify the broad economic and environmental implications of industrial operations, retrofi t options and provide new design alternatives. 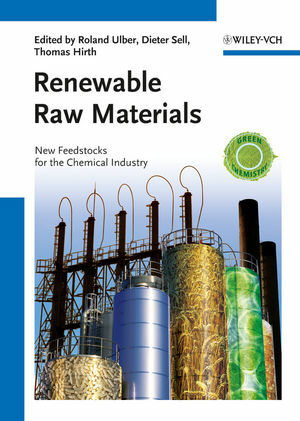 This contemporary overview focuses on cradle-to-grave life cycle assessments of existing or conceptual processes for producing valueadded fuels, chemicals, and/or materials from renewable agricultural residues, plant-derived starches and oils, lignocellulosic biomass, and plant-based industrial processing wastes. It presents the key concepts, systems, and technologies, with an emphasis on new feedstocks for the chemical industry. Each chapter uses common themes of specifi c raw materials, thus forming a natural progression throughout the book. The result is coverage from a wide range of perspectives, emphasizing not only the technical issues but also considering the market place and socio-economic aspects. Roland Ulber studied chemistry at the University of Hanover, Germany, graduating in 1994, and where he gained his PhD in 1996 from the Institute of Technical Chemistry. He received his lecturing qualifi cation from the same university in 2002, and has been Professor for Bioengineering at the Technical University of Kaiserslautern since 2004. He is involved in several national and international research projects in the area of biorefi neries, and is chairman of the working group on "Biotechnological Use of Renewable Resources" at the DECHEMA in Frankfurt. Professor Ulber's main research interest is the use of renewable resources as feedstock for chemical and biotechnological processes. A professor at Stuttgart University, Germany, since 2008, Thomas Hirth studied chemistry at Karlsruhe University with a focus on organic and technical chemistry, where he gained his doctorate in physical chemistry in 1992. Since then he has worked at the Fraunhofer Gesellschaft, initially as department head of environmental engineering at the Fraunhofer Institute for Chemical Technology, and since 2007 as head of the Fraunhofer Institute for Interfacial and Bioprocess Engineering. With numerous publications to his name, Professor Hirth is a member of various scientifi c-technical societies, such as the GDCh, DECHEMA and VDI, chair of several expert committees and a member of the council on bioeconomy. The main emphasis of his scientifi c work is on the material use of renewable resources and the development of biorefi nery concepts for integrating chemical and biotechnological processes. An extraordinary professor at Leibniz-University Hanover, Germany, since the beginning of 2010, Dieter Sell studied biology with a focus on biochemistry at Ruhruniversitat Bochum. He gained his doctorate in 1991 at the institute of chemical engineering of Dortmund University, and his lecturing qualification in 2004 from the University of Hanover in technical chemistry. From 1991 onwards he developed the bioprocess engineering working group at the Karl Winnacker Institute of DECHEMA, which he has led until 2006. This group is involved in bioelectrochemical systems, the production of bioproducts and in ecoefficiency analyses. Also, since that same year Professor Sell was head of the biotechnology department at DECHEMA, and an active member of national and international committees working on the use of renewable resources in industrial biotechnology. With the beginning of 2011 he took over the management of ThEGA, the Thuringian Energy- and GreenTech Agency located in Erfurt, Germany. Future Products from Today's Raw Materials? Introduction: Why Life-Cycle Analysis of Biobased Products? Video on ChemistryViews Watch an interview with Roland Ulber on ChemistryViews. He tells us to what extent raw materials are changing the industry, what his no. 1 piece of advice for anyone new entering the industry is, and more.